Cheer up! 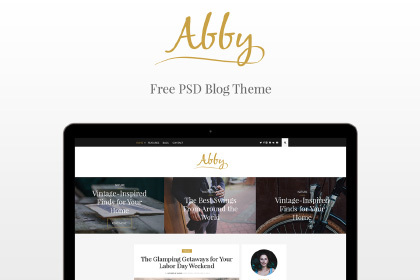 Abby free PSD blog theme is here to brighten up your day and blog. Moreover, this free template comes in handy PSD file format. It also comes along with very well organized layer to make it easier for you to customize. This will be perfect to you who looking for the clean, modern and simple design for your blog! Thanks to Antonio Hristovski for sharing this exquisite free template. Then, if you like this template, make sure to go have a look on his portfolio for more of his creative projects, latest updates and chance to get more cool freebie like this!